OLMITO — Police say a 19-year-old armed robber made off with a Hummer, but then took it back the next day. Investigators said the young man left the sport utility vehicle behind and then ran away, until he finally hid in a nearby sugar cane field. According to Cameron County Sherriff Omar Lucio, on Monday afternoon Gerson Salazar robbed Raoul Sanchez, 57, of La Feria at gunpoint, demanding his money and title to his 2004 Hummer. The robbery occurred at Sanchez’s home off Rabb Road in La Feria, he said. The following day, Tuesday, at about 1 p.m. Sanchez discovered that his Hummer had been returned. Lucio said Sanchez’s handyman informed him that a man had left the property on foot. Sanchez quickly contacted the authorities. Salazar was later located in a sugar cane field by a U.S. Border Patrol K9 unit. Lucio said Sanchez knows Salazar, but was unclear about how they know each other. At a press conference yesterday, Lucio sent a clear message. Lucio said just because a person brings back something that has been stolen doesn’t mean they can get away with the crime already committed. Salazar was arrested on charges of aggravated robbery and unauthorized use of a motor vehicle. The arrest was a joint effort by La Feria police, Cameron County Constable Pct. 5, Department of Public Safety, Santa Rosa police and the U.S. Border Patrol. 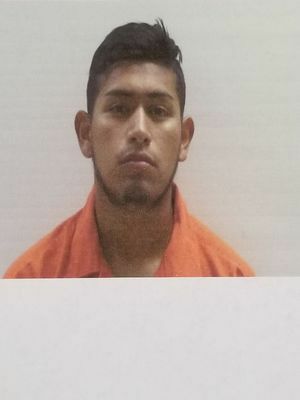 Salazar was magistrated Tuesday morning and was handed a bond of $100,000 for aggravated robbery and another of $750 for unauthorized use of a vehicle. Aggravated robbery is a first-degree felony with a punishment of five to 20 years in prison and carries a fine up to $10,000. The unauthorized use of a motor vehicle carries a state penalty of 180 to three years in prison. Lucio said it was unknown why Salazar took the La Feria resident’s money and vehicle, or why the Hummer was returned. He said the investigation is still on going.